The MS program offered by the Department of Information Systems is designed for people with, and without, an educational background in an IT field. Students may be admitted to the program in either the Fall or Spring semesters. The MS program requires satisfactorily completing 39 credits (13 3-hour courses) at the graduate level. One or more of the fundamental courses may be waived at the time of admission based on prior academic experience. As a result students entering this program will complete between 30 and 39 credit hours of graduate studies depending on their background. All MS students are required to take five core courses and then can choose five electives from the department’s course offerings. The deadlines for the MS in IS Program are April 1 for Fall and October 1 for Spring for international applicants. Deadlines for domestic applicants are May 1 for Fall and October 1 for Spring. All application materials must be on file in the IS department, by the stated deadlines for expeditious review. It is in the applicant’s best interest to apply and submit ALL materials early as we may have to cap our admissions based on the program’s enrollments. Non-degree seeking students can obtain application materials from the Graduate School’s website. Upon admission, non-degree students can take up to 2 IS courses with permission. However, permission to register is dependent upon seat availability. The majority of successful applicants have an undergraduate GPA well above 3.0 (on a 4.0 scale). Applicants without IT background are expected to have an undergraduate GPA well above 3.0 and have a solid math background (e.g., having completed some math courses such as calculus or statistics). All applicants are expected to read, speak, write, and understand the English language fluently. Those whose native language is not English are required to take a language proficiency test. The only exception to this requirement is for students who have earned a post-secondary degree from an accredited university in the United States. Students who have received post-secondary degrees from a U.S. institution and whose native language is not English may be required to demonstrate proficiency in English.We currently accept Test of English as a Foreign Language (TOEFL), IELTS (International English Language Testing System), and PTE Academic (Pearson Test of English). The minimum acceptable combined TOEFL score is 550 (written), 213 (computer based) or 80 (iBT-Internet based). The TOEFL code for UMBC is 5835. For IELTS, the minimum acceptable total score is 6.5. A minimum score of 53 is required on the PTE Academic test. GREs are not required for the MS Program. The UMBC Graduate School will accept official WES ICAP Course-by-Course evaluations as fulfillment of the requirement for official transcripts in the admissions process. Each MS student is assigned a faculty advisor when admitted to the program. No more than 2 core courses can be taken prior to fundamentals without permission of an advisor. No more than 2 electives prior to completion of 5 core courses can be taken without prior permission of an advisor. Graduate students may take no more than three classes per semester without prior permission from their advisor and the Graduate Program Director. No more than two elective courses may be taken outside of the courses offered by your program. Formal approval from your advisor is required before external courses can be taken. Courses taken from the online MS program’s curriculum fall into this category. Courses offered in the on-campus IS program and in the HCC program are not considered external and can be taken by students enrolled in either program. The courses listed here cannot be taken as electives. Students will be allowed to complete up to two, pre-approved courses from the Online MS program’s curriculum to satisfy their degree requirements. Courses are approved by the Graduate Program Director and are dependent upon space availability considering enrollments in both on campus and online courses. Students will be charged the standard on campus tuition and fees and will be responsible for purchasing all books and supplies associated with the online courses. Students choosing to do a masters thesis route must complete IS 799 over the course of two semesters (3 credits each semester). Students must also choose a thesis advisor from the department and form a three member committee that oversees and accepts the thesis. An MS Thesis defense must be scheduled with your advisor and committee. 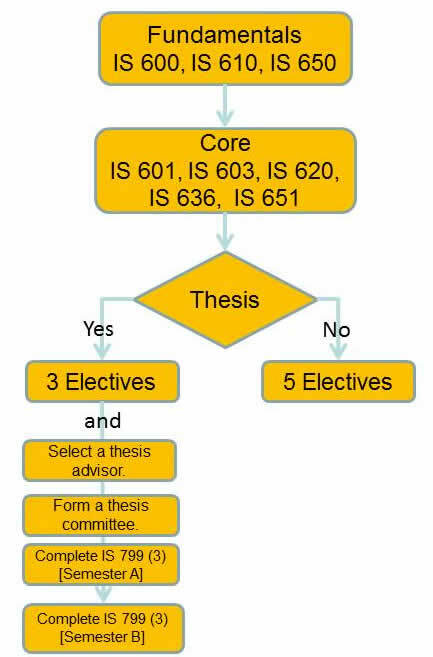 The thesis must to be pre-approved by the advisor and submitted to the thesis committee at least four weeks prior to the proposal or final defense. MS students must maintain a B average, (i.e., 3.0 GPA). MS students may not count courses that are audited as part of the MS program and may not take courses under the Pass/Fail option. MS students may take ONE independent study which counts as an elective, usually taken toward the end of the degree. In order for a MS student to take an independent study course, the student must submit the Proposed Independent Study Form. All graduate students should consult the University Graduate School Catalog, which contains the University’s regulations and procedures for earning degrees. MS students who graduated from the IS BS program must substitute additional electives for IS 603 and 636. If you took any cross listed courses, you cannot take the course at the graduate level for credit towards your degree. Any fundamentals courses (IS 600, IS 610, IS 650) which are waived upon admission cannot be counted as electives in the MS program. These courses cannot count toward the 30 credit hour minimum required to earn the MS degree. Students can only count one 651 lab for credit towards their degree requirements. This includes IS 651M, 651U or 651W. If you need any further information, please contact Shannon Keegan (keegan@umbc.edu).